Last call, students! Registration extended till 6 January 2017. Join CIMB Talent Trail for a chance to win cash prizes worth RM25k, and test your employability skills while you’re at it. So, sign up now! What is the CIMB Talent Trail? Want to be a CIMB Talent Trail participant? You must have a lot of energy – be mentally and physically fit as there will be intensive walking/running, as well as puzzles to complete the challenge. If you qualify for the Grand Finale, be prepared to navigate around Kuala Lumpur using public transport. Be prepared for real fun and win attractive prizes! Blaze Your Way to the Top and Win Cash Prizes Worth RM25,000! Calling all Malaysian university students! Come together for a challenge made fun with exciting activities, and find out how employable you are in the corporate world. 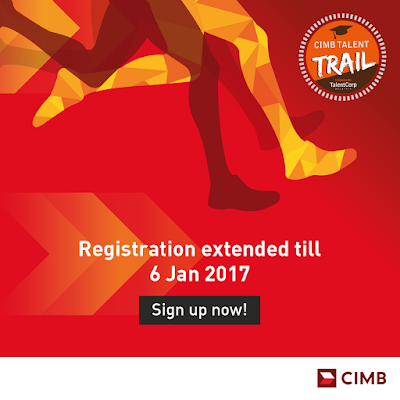 Sign up for the CIMB Talent Trail now and put your skills and English language proficiency to the test! Gather your team and register by 6 January 2017! Answer the Quiz section correctly in the Registration Form to qualify for Regional Rounds! Regional Rounds are happening on these dates! 60 Teams from 3 Regions will battle it out on 25 February 2017 at CIMB, Menara Bumiputra-Commerce, Kuala Lumpur! Cash prizes totaling up to RM25,000 are for grabs!